Let’s just begin by saying that if this were a competition, Archana and Jim’s wedding would receive all three medals. Seriously…WOW! This Telugu fusion extravaganza was orchestrated by none other than the rockstars at, yes you guessed right, K.I. Weddings! We still wonder how they manage to marvel us every single time. 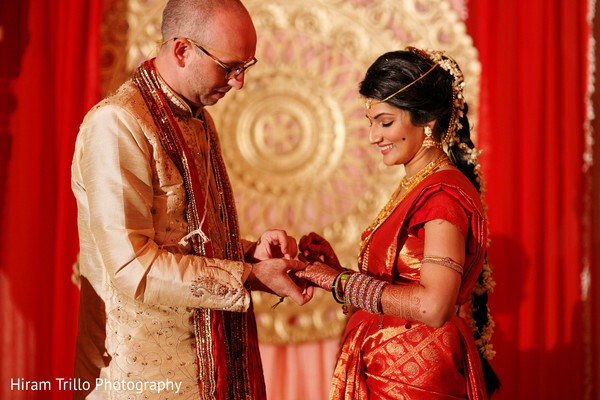 There are so many elements exclusive to Telugu weddings, and only Hiram Trillo Art Photography could have done justice to it. Red is truly Maharani Archana’s color, because that perfectly pleated and draped Kanjeevaram sari looked glorious on her (yes, she looked like a princess even when she was seated in a bamboo basket.) 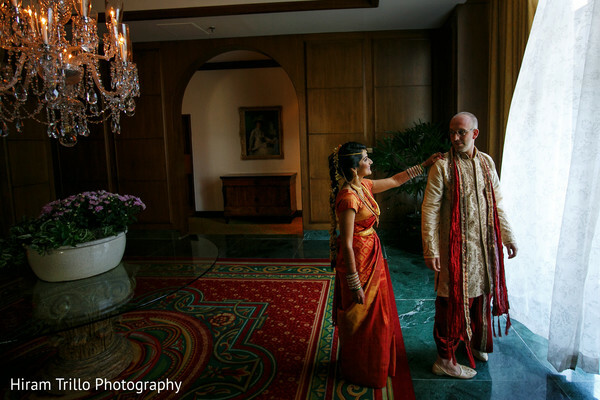 Sari draping is a tough skill to master, and that said, Draped 2 Nines did one neat job with Archana’s. 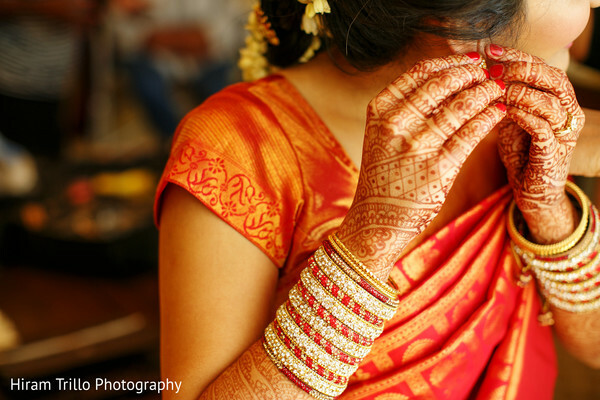 Kudos to Makeup by Shilpa for doing such an awesome job with our bride’s clean and fuss-free makeup, and the sleek jasmine-flower-adorned traditional Telugu braid. 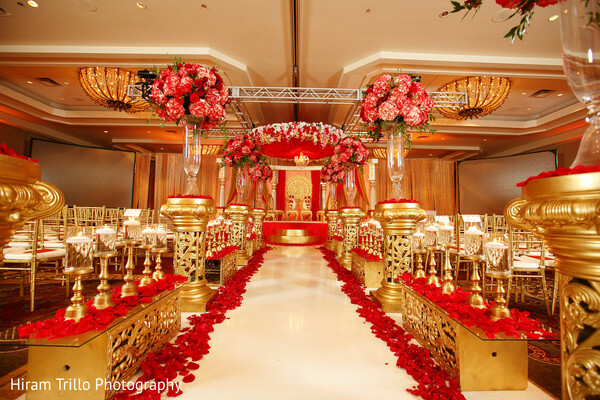 We were in awe of Decor One’s work on the entire ballroom, starting with the aisle entrance that featured decadent red curtains on an antique gold columned archway. A little display included an aesthetically written “this is how our story begins…”, creating a perfect segue into the aisle that was bedecked with rose petals, floating chandeliers, and glass vases with red flowers atop gold columns. 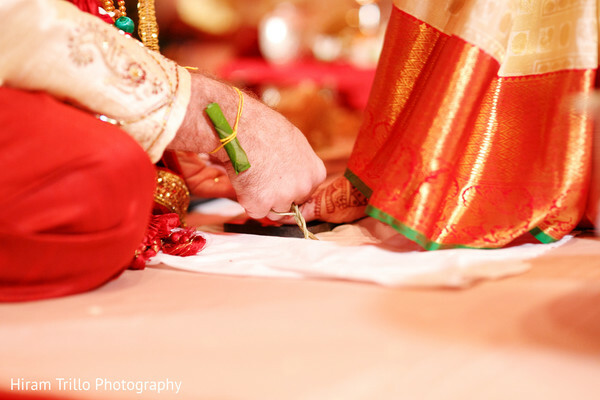 With such a gorgeous build up to it, the mandap surely did not disappoint! The semi arch structure with red, pastel orange, and lace gold drapes was a sight to behold. To top it all off, a dramatic, draped floral dome on the ceiling was one gorgeous finishing touch. The delicious spread of regional delicacies was catered by Vindu Indian Cuisine. The live action was captured on film by Memories Films. 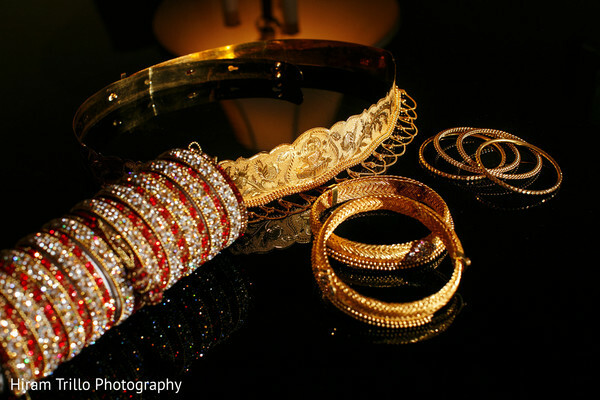 Revel in this red and gold fiesta by heading straight to the gallery, one that you do not want to miss! 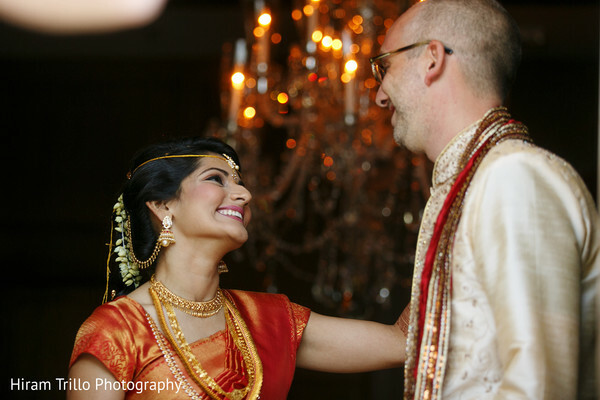 We’ll see you soon at Archana and Jim’s swanky reception where K.I. Weddings created the sweetest scene in collaboration with Decor One. Be back in a moment!